2. 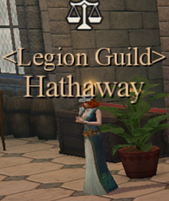 Find Hathaway in your guild to buy them. 3. 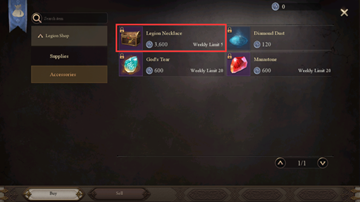 Buy necklaces from other players at the market. 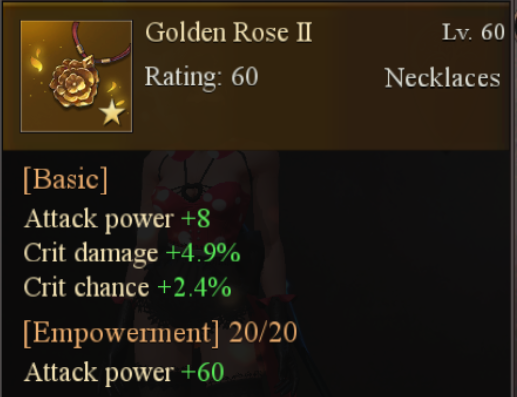 Necklaces come with basic stats and empowered stats. Each necklace has basic stats which cannot be changed. Depending on the necklace's quality, it will have 1-3 basic stats. The worst necklaces only come with attack power, better ones come with both attack power and crit chance, and the best with attack power, crit chance and crit damage. To empower a necklace, find Leia and give her the required resources. More detailed information regarding how to empower necklaces of different qualities can be found later in the guide. But before that, here are three necklaces as an example. The first one is of the worst quality, which is why it only has attack power, and can only be empowered 15 times. The second one is of medium quality and has fire attack power as well as crit chance, and can be empowered 20 times. The third one is of medium quality and has poison attack power, crit chance, as well as crit damage, and can be empowered 20 times. Empowering your necklaces requires the help of Alchemist Leia. Find her on the map, talk to her and choose Alchemy. 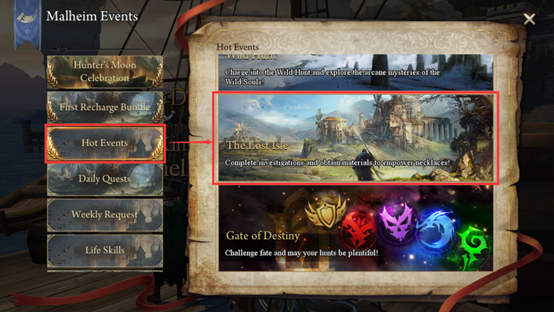 Then choose Empowering Necklaces to enter the correct menu. 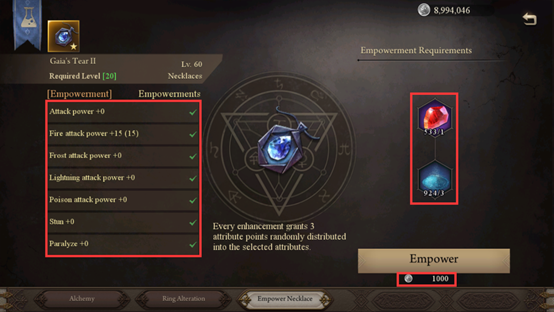 There are seven types of empowered stats, and you may choose the ones you want (all are selected as default). Empowering will choose three stats at random from the ones you have selected. Empowering costs Magic Crystals, Diamond Dust and Silver. The cost depends on how many empowered stats you choose to remove. As can be seen from the pictures below: when all 7 stats have been selected, empowering will choose 3 of these at random, and only costs 1 Magic Crystal, 3 Diamond Dust, and 1,000 Silver; if you choose only attack power (all 3 stats would all become attack power), it would cost 15 Magic Crystals, 200 Diamond Dust, and 50,000 Silver. So, when you are empowering your necklace, try making the best choice for your specific situation. If you are unhappy with your empowered stats, you can click the "Reset" button to delete them. However, doing so won't give you back any of the spent resources or coins. And this concludes the short introduction on how to empower your necklaces in Rangers of Oblivion. I hope this will help everyone get their hands on a top-tier necklace of their own!